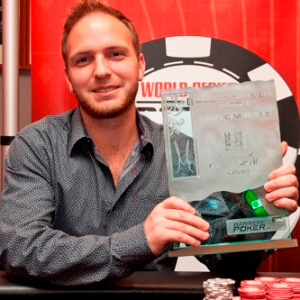 After holding off the 2012 high-roller king John Juanda, Canadian poker pro Mike “SirWatts” Watkins was able to take down the €50k Buy-In NLHE High-Roller tournament at the 2012 World Series of Poker Europe tournament series. The event was the first of its kind at the WSOPE, and not only did it feature a lofty €50k buy-in, but players were also allowed to rebuy into the tournament, swelling the total prize-pool. Watson was among 49 players who registered for the tournament, and with a total of 11 rebuys the event saw the prize-pool flirt with €3,000,000, coming in at just under €2.9 million, with €1 million set aside for the winner. By the time the final table got underway, the field was full of big names from the poker world, along with one amateur, Macau high-roller Richard Yong. Yong is no stranger to these high-priced events having participated and cashed in the Big One for One Drop tournament and recently finishing second in a £100k buy-in event in London. In addition to the aforementioned Juanda, Watson, and Yong, the final table featured high-stakes cash-game pro David Benefield, a pair of German poker phenoms in Philipp Gruissem and Tobias Renkemeier, 2011 breakout star in the poker world Steve O’Dwyer, and one of the top tournament players in Europe Jani Sointula. It was tough path to victory for Watson, who began the day with just 12 Big Blinds, but he showed his skills and picked his spots beautifully throughout the final table. For Juanda the second place finish caps off an impressive year playing High-Roller tournaments. In 2012 Juanda has finished in 3rd in the $100k buy-in Super-High-Roller tournament at the WPT Championship back in May, where he pocketed $525,000; he also finished in 5th in the recent $250k buy-in Macau High-Stakes Challenge Super-High-Roller tournament that took place in August at the WinStar Casino, and was one of the richest tournaments in poker history –for his 5th place finish Juanda earned $1.6 million. The man known as “SirWatts” both online and among his friends is one of the most consistent performers on the tournament trail, having been a fixture at poker tournaments around the globe since 2007. This is the second seven-figure score of Watson’s career (he won the 2008 WPT Bellagio Cup IV where he collected over $1.5 million) and he now has over $5 million in career tournament earnings. Despite his live success, Watson is best known for his online poker exploits, where he is considered one of the best to sit behind his computer and play the game.